Forging Fraternity | Fourth Dimension Inc. Neither liberty nor equality can be sustained without inner fraternity which holds the key to a lasting social synthesis. Some kind of fraternity can be forged at the material, economic, social or political domains or in the vital or mental levels of our surface being. But all these fraternities cannot create an enduring and stable bond of unity. They can be destroyed by the sudden rush of opposing forces of division, darkness or violence surging from within us from our lower nature or from without in the external environment. Only when we are able to realise an inner fraternity in the deeper psychological and spiritual levels of our consciousness and allow it to organize itself spontaneously from within outwards in the external life, we can have an enduring fraternity which can survive all the shocks of outer life. This may appear as a far-off ideal remote from the present condition of humanity. But we can consciously and progressively move towards the ideal by deepening, widening and strengthening the existing trends and forces of unity and conversely by weakening, neutralizing and eliminating the forces of division. Let us briefly examine how this can be done. There is a vague sense of fraternity among those who belong to a geographical region like a community, state or a nation or who live and work together. For the material life of man is not merely raw matter. It is shot through with psychological forces and energies. So when people come together for material or vital reasons it creates a vague sense of subconscious psychological fraternity. This subconscious sense of unity is perhaps much more consciously felt among those who live and work together. This physical or vital sense of fraternity can be made strong and vivid by emotional identification with the group like for example patriotism or religious devotion or loyalty. 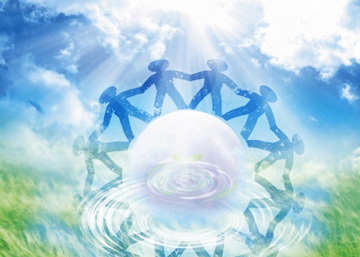 Similarly there is a mental fraternity which is felt when people are drawn together under some common mental, moral or spiritual ideals or shared values. This creates a more conscious sense of fraternity than that of the material or vital kind. All these forms of fraternities can be strengthened by collective disciplines like social or cultural get-togethers, group-meditations or study circles or by other methods which leads to a passionate emotional involvement with the group or idea. But until now, in the history of humanity, most of these fraternities created only collective egos – economic, social, political, cultural or religious or sectarian fraternities or “brotherhoods” which are most of the time in conflict with other fraternities which are differently constituted or based on different ideals. Moreover there is no real inner or outer harmony even within these fraternities. There is always a constant conflict, open or hidden, inner or outer among the individual members of a community. On the more positive side, there was a progressively expansive identification with larger collectivities from the family, clan, community and the nation. The present push towards globalization and transnationalism may lead to further extension in identification towards a supranational aggregate. There was also a substantial progress in the capacity for collective organisation and the ability to materialise an idea in the collective life. There is a certain amount of preparative inner and outer growth in this collective experiences or experiments of humanity. To arrive at an enduring fraternity in the future, we have to deepen, enlarge and universalise the positive experiences of fraternity in the past and neutralize or eliminate the negative factors. The first stage of deepening and widening comes from inner purification of the mind and heart by rejecting all thoughts and feelings which narrows, divides, darkens or grossifies our consciousness and conversely, cultivating those thoughts and feelings which widens, purifies, enlightens the consciousness, and unites us with others and the whole of terrestrial creation. The ethical and religious method is to provide a list of negative thought and feelings which have to be rejected like for example anger, violence, lust and conversely, a list of virtues to be cultivated like kindness, generosity. Extending this ecological logic further we can say that the life of a Nation should feel itself as part of the single life of Humanity, the life of humanity as part of the ecological unity of the terrestrial life, and finally the human and terrestrial creation as part of the spiritual unity of a transcendent and universal Reality, which we may call as God or whatever name we like to give. Each religion has to enquire and discover its unique and special genius and mission for realizing this spiritual unity of all creation and its unique contribution for the spiritual progress and well-being of humanity and earth. It is this type of broad ecological thinking which has to be awakened in people, especially in young minds, through right education in order to prepare human consciousness for an enduring fraternity. But, ideas, ideals and sentiments in the surface mind, through very helpful as a preparatory education, are not sufficient to create a sustainable fraternity. We may have to begin with ideas in the mind. We must progress further and find a way to make the idea emotional, experiential and concrete to our consciousness. This requires a system of education based on the principles of Yoga. We will come to this subject a little later in our concluding section on Sustainable Education. As with the ideal of equity, so also with Fraternity, the inner realizations of fraternity through education has to proceed in parallel with preparing the outer environment through thought and actions which are favourable to the progress of fraternity in society like for example uniting and synthesizing ideas; creating harmonious, symbiotic and mutually complementing links and relationship between individuals and collectivities; international and inter organizational cooperation; cross-cultural interaction and understanding.